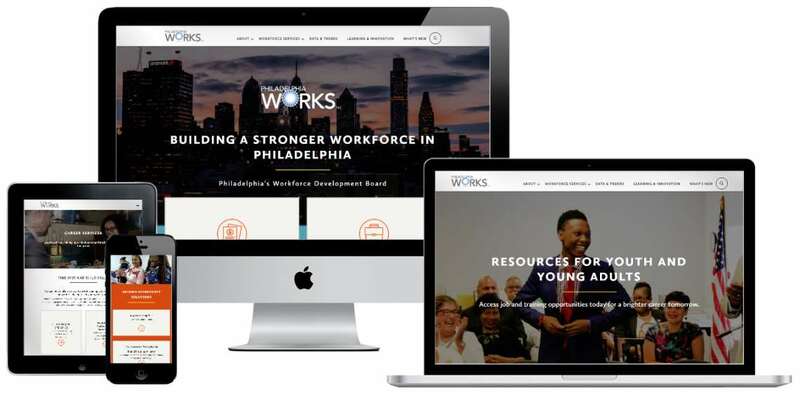 SUCCESS CASE SPOTLIGHT: Philadelphia Works, Inc.
Philadelphia Works is the city’s Workforce Development Board, investing in solutions and services to grow Philadelphia’s economy by connecting employers to workforce talent and career seekers to jobs. They influence the public policies that support economic growth and optimize funding and resources to invest in regional solutions to build a skilled and thriving workforce. The existing website’s structure was confusing, the design was outdated, and it was difficult to navigate. It was difficult to understand exactly what the organization provided in terms of its numerous offerings, including critical workforce services and solutions for both career seekers and employers alike. The usability issues limited the site’s functionality on top of the poor structure. Not just that, key website data points were not well understood or factored into the decision-making process. We implemented a simplified component-based design system, improved functionality, and enriched content areas that connect residents with career opportunities and provide employers with access to the talent they need to be competitive. The website’s mobile-first and modern platform is designed for improved user experience. This enables users to be able to digest information in chunks, with the most relevant, useful content first, and as quickly as possible. This ensures the best experience possible, with speed and usability top-of-mind, rather than an afterthought. Before getting to work, we grabbed every relevant data point we could to enable us to understand the target audience and then mapped out an intent-driven keyword strategy—to best serve users towards their journey. We prepared the platform for voice search and connected every relevant data point with an interactive Data Studio dashboard for a fully-integrated marketing machine from the get-go. We implemented a proactive monitoring solution and a continuous testing automation suite—regularly monitoring security, SEO positions, latency and more—to ensure continued site performance and security. We provided our partners with training, an easy-to-follow administration manual, and transferred implementation knowledge. The new site features a wealth of easy to access information and features interactive reports and trends, an interactive map of programs for young adults, an interactive career pathway selector, and so much more. So far, the new site has successfully increased traffic by thirty percent, enhanced engagement by over 519% in session time and a reduced bounce rate by five percent. We also helped increased brand awareness and decreased load time under three seconds. The new site has been selected as a Best In Class Nonprofit Website by the Interactive Media Awards, and it also received a 2019 Gold award in the Mobile Information Experience category by the AVA Digital Awards as well as a 2019 Gold Hermes Creative Awards, both administered and judged by the Association of Marketing and Communications Professionals. Not only did we help with the development of an optimized, mobile-first platform—but we also enabled our partners to take a major leap towards digital transformation by unifying important data sources and making sense of them. We helped every step of the way and decided on KPIs to measure, collated data sources, and implemented a unified, interactive dashboard featuring near real time insights to enable managers, directors, and the c-suite alike to make even more data-informed decisions. We took this a step further with an Executive Scorecard, summarizing a snapshot of the performance and benchmarked against previous periods to meaningfully measure impact. Credits: Developed by Ali Jaffar at Key Medium, with content strategy by Rachel Dukeman at RR Creative and Kasey Thompson, the new PhilaWorks.org is a testament to our region’s talented workforce. The design was produced by P’unk Avenue in conjunction with a committee at Philadelphia Works led by Meg Shope Koppel, Ph.D., Chief Research Officer and Elena Vayner, Manager of Programming. Philadelphia Works is proud to hire local talent. Ali Jaffar has been building dazzling websites and creating amazing online experiences for over a decade. His mastery of the latest innovations in web development results in world-class website experiences set apart by show-stopping style and seamless functionality. A Google Mobile Sites and Google Analytics qualified individual and award-winning web development guru, Ali lends his talents to build and bolster digital experiences for a wide array of clients. When Ali’s not helping his clients grow, you can find him doing yoga, walking his dog, exploring beautiful open spaces, and enjoying a nice bike ride around Philly.